Royal Niestern Sander has a wide, multi-specialized experience in ship repairs. The company has specialists in all existing sub-disciplines. This is an appropriate response to the demand for surveys, appraisals and the possible subsequent maintenance and repair orders. 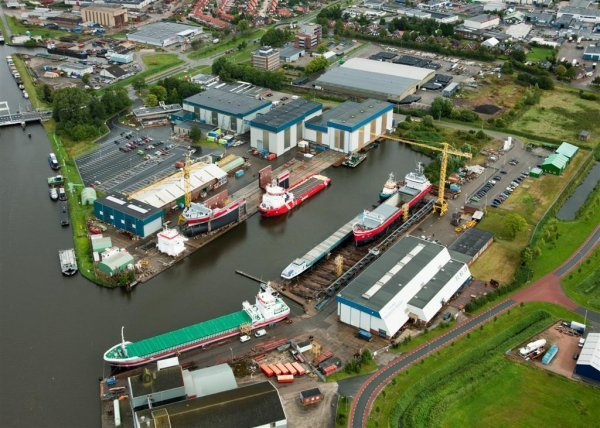 Shipyard Royal Niestern Sander is located in the Northern part of the Netherlands with a direct connection to the North Sea via the port of Delfzijl. A significant area of the Delfzijl harbour accommodates one of the most modern and versatile shipyards of the Netherlands, the yard of Royal Niestern Sander. Royal Niestern Sander is a member of Conoship International, Netherlands Maritime Technology, FME/CWM as well as SBE. Royal Niestern Sander is certified for ISO 9001 and SCC** (VCA**). and construction of ships up to 14,000 dwt and has a track record ranging from multipurpose dry cargo vessels, IMO 2 tankers, bulkers, containerfeeders to anchor handling tugs and ice breaking support multipurpose vessels (IMSV’s). Latest addition to this list is a maintenance support vessel for the offshore industry. Shiprepair. Conversions and lengthenings. Offshore (accommodation units). De-/mobilizations. Carpentry. Facilities:2 floating docks for ships up to 200 m. length * 25 m. breadth and max. 10,000 tlc.600 m. quay.